Have you ever had frosé? 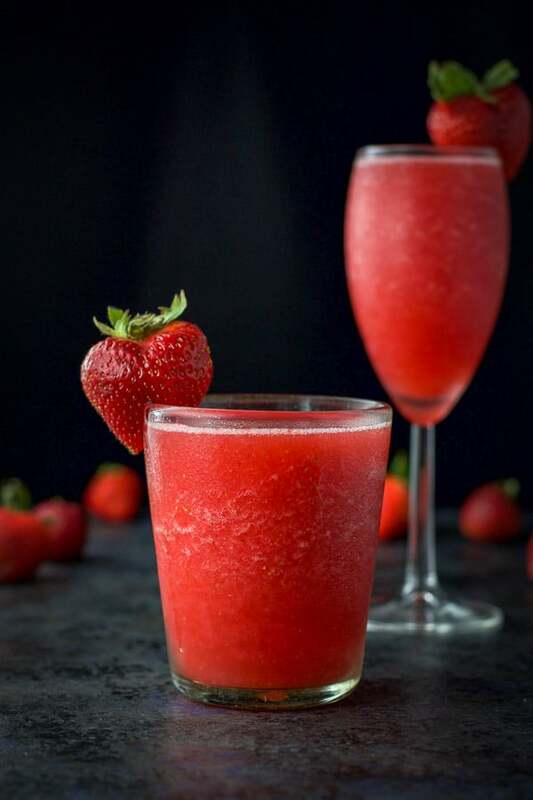 How about a strawberry rosé cocktail? 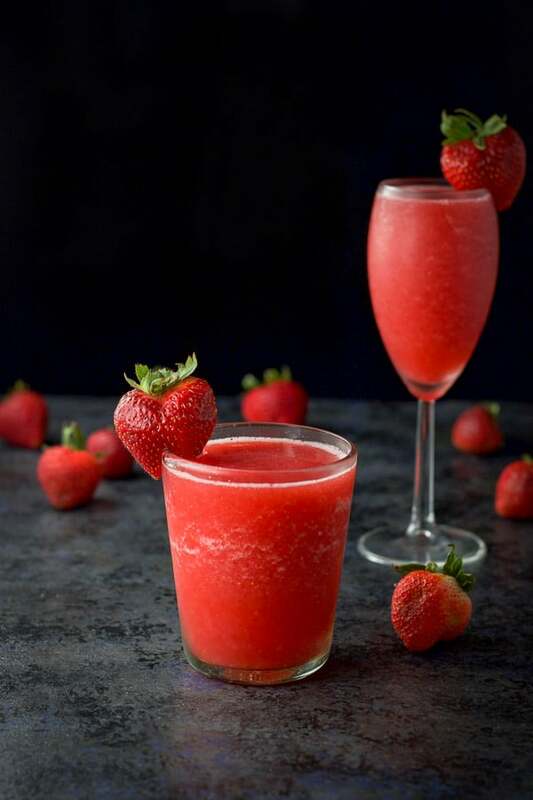 This strawberry frosé recipe is delightfully delicious and wonderfully refreshing. Don’t you love the blending of two words? Frosé. Frozen rosé! Clever and cute! This is a fun and tasty frosé recipe. 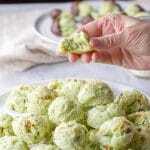 I heard about this recipe a few years back from my friend, Sadee. Her family goes ga-ga over her frosé. So, I thought I’d try my hand at it. And boy, I’m glad I did. 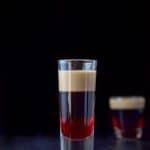 What is unique about this frosé recipe? Can I use white wine instead of rosé? The taste. If you served this to someone who didn’t know what was in it, it would take them a few sips to figure it out. The elusive taste is wine. That’s what I love about it. It’s subtle enough to be intriguing but familiar enough to recognize the rosé. Yes, you sure can. Just know that the taste will change because of the distinct difference between white wine and rosé. I’ve made it both ways, with sauvignon blanc and with rosé, and truthfully, I like it better with rosé. 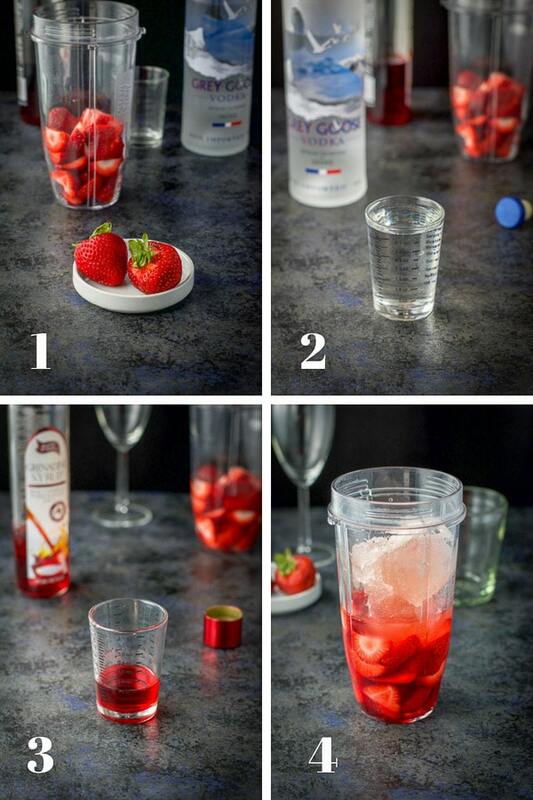 The ingredients: rosé ice cubes, fresh strawberries, vodka and Grenadine. 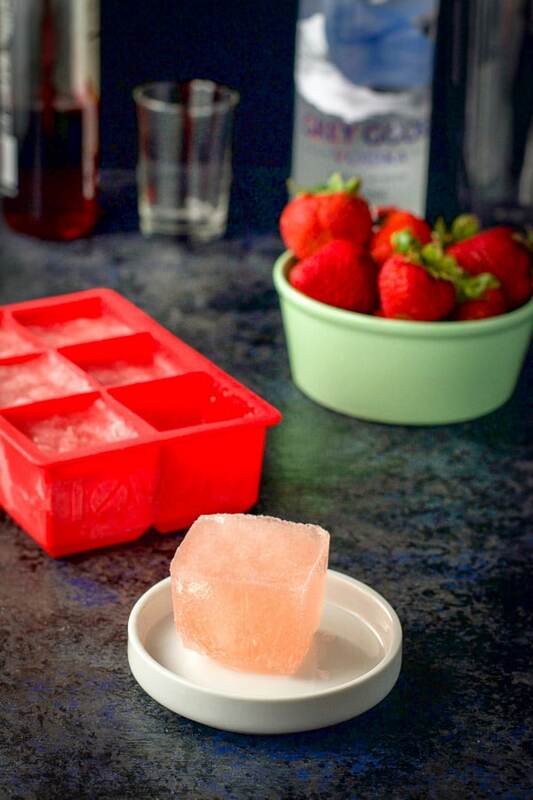 The night before you make this cocktail, pour some rosé wine into an ice cube tray and freeze overnight. Get your blender and once you measure out each ingredient, pour it into the blender. 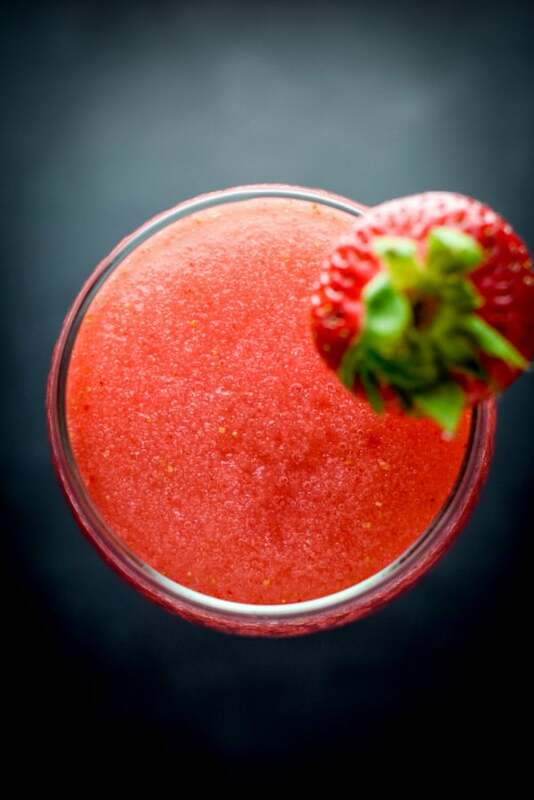 Gather the ingredients – frozen rosé, strawberries, vodka and grenadine. This is so exciting, isn’t it? 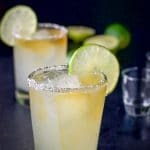 It can’t just be me that loves to craft cocktails. And drink them. Add a few more ice cubes and blend until thick. 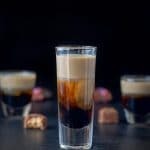 Don’t be afraid to add more ice cubes until it reaches the right consistency. Divide the frosé between the two glasses and stick a strawberry on the side of both glasses. And now the aerial view. 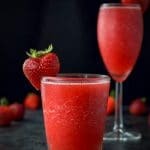 I hope you enjoyed this frosé recipe! Please leave me a comment to let me know what you think. What is your favorite wine to drink? White, red or rosé? 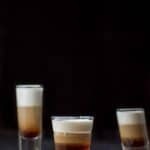 If you’ve tried this frose or any other recipe on the blog, I’d love the hear what you thought about it in the comments below. I love hearing from you! You can also FOLLOW ME on FACEBOOK, TWITTER, INSTAGRAM and PINTEREST to see more of my delicious food and delightful cocktails! Great summer refresher beverage. And light. Love it. OK! YUMMMMM! I am going to try this asap! It’s hot in Kansas today and this would be perfect! I love the last three steps of your recipe! This looks so refreshing and perfect for the bbq we are having at the weekend. Love the colour. Strawberries and wine?! I’m so in! Cheers! Oh, yes! That’s a grand idea Lauren! I love frose! we’ve been using sugar, so grenadine is a fantastic tip for a sweetener. Thank you Helena, and yes, best friends indeed! That looks like the most perfect summer beverage Elaine! I will keep that up my sleeve for when summer rolls around 😀 Absolutely love that colour too! That looks like such a delicious cocktail, Elaine! And the photos!!!! It looks like I can stretch out my hand and have one of those pop right out screen! Gorgeous! Oh my, what a beautiful cocktail Lainey! I’d love to just stroll around with it in my hand, so elegant, sorry I’m vain lol! Plus I love all the flavors in it. This one again tops my other top favorite cocktails of yours! Hehe! Thanks Patty!! You are so sweet!